The Treadwell Historic Preservation and Restoration Society is dedicated to preservation of mining ruins and restoration of the 1915 Alaska Treadwell Gold Mining Company office building, creating a museum and interpretive center. 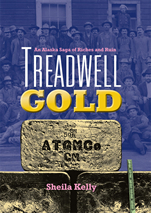 History of the Treadwell Mines Alaska - a historical picture book about the world-class gold mine at the turn of the century. This site offers audio narration.